Latest Piracy Figures Released...And 4 More. Latest Piracy Figures Released…And 4 More. The IMB has published its report on piracy and armed robbery for the second quarter of 2017, covering the period from 1 January to 30 June 2017. 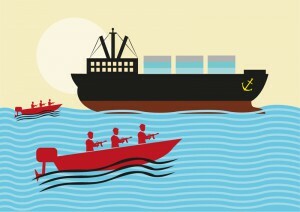 The report highlights continuing decline in the number of incidents of maritime piracy. 87 incidents have been reported in the first six months of 2017, with 63 ships boarded, eight attempted attacks, four ships hijacked and 12 ships fired upon. This represents a decrease from 2016 when there were 97 reported incidents in the same period. In relation to crew, the IMB reports that 63 crew members were taken hostage, three injured, two killed and 41 kidnapped. Human Rights at Sea has published an investigative report into the abuse of seafarers on board a UAE-flagged vessel moored offshore the UAE coast owned by Alco Shipping Services. Members of the crew of the tanker “MT IBA” told Human Rights at Sea that they have been threatened with criminal proceedings. Their basic human rights breached, with a deprivation of liberty, lack of protection for their health and bodily integrity, lack of protection for their right to life and lack of family life due to their enforced retention on the “MT IBA”. In addition, for the last six months the crew have been denied access to medical treatment. Satellite imagery and remote sensor data confirm that the Larsen C ice shelf has finally released a giant iceberg, a massive sheet large enough to cover most of Delaware. The shelf has been cracking for years and scientists had long anticipated the event. The immediate consequences for sea level rise are minimal, and the event’s connection to climate change is not clear. “We see no obvious signal that climate warming is causing the whole of Antarctica to break up. However, along the Antarctic Peninsula, where we have seen several decades of warming through the latter half of the 20th century. ISWAN and CHIRP have entered into a MoU to cooperate in improving seafarers’ safety and welfare. By working together, ISWAN through its SeafarersHelp will assist seafarers to complete the initial report to CHIRP highlighting unsafe working practices. This will be particularly helpful for seafarers whose first language is not English. ISWAN regularly hears from seafarers about unsafe working practices and in future will assist seafarers to complete the initial report to CHIRP highlighting lessons learned. By working together in this way, CHIRP and ISWAN will help to ensure that seafarers’ safety and welfare are given a high priority. The master of a vessel which has run into trouble with the ITF, and whose crew were believed not to have been paid, as chosen to lash out against the union. In a letter to Lloyd’s List, the master claims that all MLC requirements are in place, and that the ITF has no role or jurisdiction in the case. Quite whether the master has been forced into such an outburst is unclear, however it seems slightly at odds with the impression of crew welfare surrounding the vessel.